You might think you are familiar with what a farmer offers but every season offers something new. You might think Ortiz Bros only has vegetables but they always have a seasonal flower bouquet. Pictured here curly willow, eucalyptus and statice fragant and long-lasting. 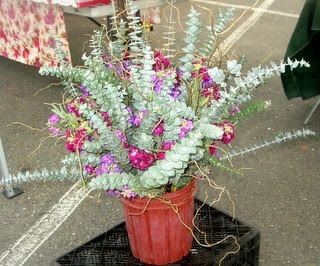 Skyview Nursery has colorful plants that survive the cold nights in Sonoma County. The colorful violas and pansies have a sweet fragrance. Just as lovely in your house as providing some color in your yard. Glenn also has hardy greens which will thrive in the winter months. You can still have a winter garden. Talk to Glenn about your micro-climate and he can recommend the plants that will thrive for you all year round. 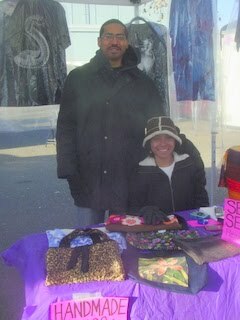 Ortiz and Skyview are both at the Wednesday and Saturday markets. Wednesday is a great market to chat with the farmers. 8:30 -12:00 ez parkking. Seafood is another category where imported fish is growing dramatically. Eating locally is really a guide to eating seasonally. It is the best way to guarantee food that is not only good for you but truly tastes wonderful. kinds of fish. 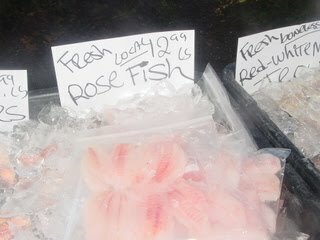 Right now Santa Rosa Seafood has rosefish. Rosefish – This important commercial fish is a member of the rockfish group. Also known as “ocean perch,” although it is not a true perch. Set oven for 400 degrees. Cover bottom of baking dish with lemon and onion slices. Sprinkle lightly with salt and pepper. Lay fillets on top. Cover. Bake 20 minutes. Remove cover; combine remaining ingredients; spread over top. Broil 3″ below heat until browned. Preheat oven to 350 degrees. Grease shallow baking dish; arrange fillets in dish and sprinkle with seasoned salt and pepper. In small skillet over medium heat, melt butter. Stir in bread crumbs; sprinkle over fish. Bake 15 minutes or until fish flakes easily when tested with a fork. In a cup, combine chili sauce, lemon juice and Worcestershire sauce. Serve with fillets. Makes 3 servings. Preheat oven to 350 degrees. Cook onion slowly in butter or cooking oil until limp, not brown. Spread onions over bottom of shallow, 2 quart baking dish. Cover with fish fillets. Combine mayonnaise or salad dressing, cheese, lemon juice, Worcestershire sauce and paprika; mix well. Spread evenly over fish. Bake for about 25 minutes or until fish flakes easily when tested with a fork. Sprinkle with oregano or chopped parsley as desired, just before serving. hope this helps. good luck and enjoy. “..sometimes, it’s like hitting a vegan food jackpot – like the bolanis and sauces from East and West Gourmet Afghan Food. Bolani is a traditional Afghani thin flatbread stuffed with either spinach, potato, lentil or pumpkin and baked. Even though it’s low-fat, low-cal and low-carb, it’s very tasty as well as filling. One serving of the spinach bolani is just 103 calories. Top with any one or a combination of their many sauces and spreads for a delicious layering of flavors. For the spreads, I got the Lentil Curry and Cilantro Pesto. The curry is not really spicy hot but it’s got plenty of taste. The pesto is also very nice and light as it’s made without any oil. The most addictive thing to come out of Afghanistan since opium. Bolani means “filled bread” in Farsi. 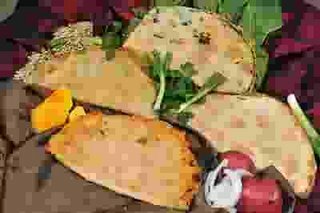 It is a thin flat-bread baked with vegetables in them. They are low-calorie, low-carb, low-fat, and low-sodium; but they are nutritionally dense and sustainable and can be served as a whole meal in itself. Best of all, they are deliciously addictive. 49’er fever has hit town. For some it it is more about the snacks during the game. If you want to have the best things to eat come to the Saturday market and stock up. We’ve got the best game day treats around. Mi Fiesta is great for one stop shopping – chips, dips, salsas, tamales, enchiladas and plenty for the vegetarians on your guest list. The Press Democrats Michelle Anna Jordan gives the Wednesday market a big shout out! Published: Wednesday, January 18, 2012 at 4:00 a.m. The Santa Rosa Original Certified Farmers Market has always taken on both Wednesdays and Saturdays, yet even after several decades at the same location, the east parking lot of the Veterans Building at the corner of Maple and Brookwood Avenues, the Wednesday market is nowhere near as well attended as the Saturday market. But this market is an excellent mid-week resource, offering opportunities unavailable on Saturday. Parking is easy, as is getting into and out of the market. The market’s leisurely pace makes it easy to chat with farmers and ranchers, one of the ways to truly understand what you buy. Dream Catcher Ranch attends only on Wednesdays. Last week, the Santa Rosa ranch had several types of meat, including pork bellies and jowls, for sale and also was soliciting members for its CSA program, which offers Berkshire pork at just $5 a pound and bison, available only to CSA members, for $9.50 a pound. Neufeld Farms has dried pears, apricots, pluots, white nectarines, yellow nectarines, Bing cherries and delicious Royal Anne cherries that include, the vendor warned me, pips, underscoring a new trend, the surprise of seeds. Tom Noble of Armstrong Valley Farm also cautioned me that his clementines have seeds; his brother suggested posting a warning sign. I blame this on the popularity of seedless watermelon, which is grown not for taste but for seedlessness. But people, fruit has seeds! As heirloom varieties become increasingly common, expect to encounter more seeds and pips. It is simply how nature works. Mei-Hee Hill Gardens of Sebastopol still has fresh jalapeños, along with dried chiles, kale, lettuces, chard and wonderful labeled plant stakes for your spring garden. Hector Alvarez also has fresh and dried chiles, along with onions, fresh tomatillos, persimmons, winter squash and, of course, honey. Triple T has braising greens, lettuce mix, herbs, broccoli, spinach, hot sauces, chicken and duck eggs and, sometimes, fresh chicken, which you need to request, as it is not displayed. When it comes to prepared foods, there’s plenty, including roasted almonds from Redel’s Roasted Almond; jams from Just Like Grandma’s; a selection of oils from The Olive Press; breads and pastries from Full Circle; dips and sauces from The Hummus Guy; tamales, enchiladas and salsas from Mi Fiesta and lobster cioppino and smoked trout from Santa Rosa Seafood, which also has fresh fish, clams, mussels, octopus and salt cod. Bohemian Well-Being Farm attends this market with shiitakes, oyster mushrooms and other fungi, including maitake mushrooms, which you should ask for if you don’t see. DeSantis Farms has an extraordinary selection of familiar and exotic citrus, including Cara Cara oranges, and Schletewitz has good sweet potatoes, naval oranges and other citrus and some late-harvested crimson grapes. With rain predicted, at last, for the next several days it is important to keep in mind that all our year-round farmers markets, including this one, take place rain or shine. 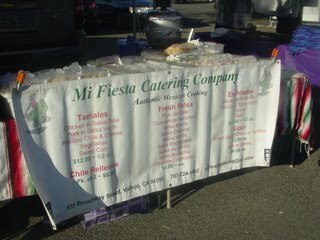 Santa Rosa’s Wednesday market opens at 8:30 a.m. and wraps up at noon. Two new vendors at the Wednesday market – fresh flavored almonds packaged for snacks and handmade bags and beautifully screened T-shirts. The handbags are made by Vida 707- 596 1055 she provides a complete array of sewing services including alternations and repairs. There is always something to delight the senses at the Wednesday market. 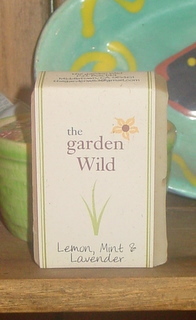 The Garden Wild produces soaps and cremes made from scratch using only natural ingredients. Too bad we don’t have scent-o-vision – the soap pictured is lemon, mint and lavender and it is wonderful. There is a nasty cold going around…. ” The face mask is a common site living in Japan through both the winter months and through hayfever season. Your initial reaction may be to run when you see someone wearing the mask in case they might pass on to you whatever illness they are hiding behind the mask, or maybe its just a flashback to a bad dentist or doctors trip. Many people know the old saying that you should feed a cold and starve a fever. Most doctors agree that you should not force yourself to eat during illness, but you also should not restrict yourself if you feel hungry. So what is best to eat when you have cold or flu? Here are the most powerful foods that boost your immunity to fight off common cold and flu. Garlic is long known to be a great food that protects the immune system from a wide range of bacterial and viral infections. People, who eat garlic regularly, are less likely to catch cold or flu thanks to a number of helpful compounds. Garlic contains allicin, ajoene and thiosulfinates, which guard your body against cold and flu. Eating garlic during cold will shorten the amount of time it takes you to heal and alleviate the common cold and flu symptoms, such as cough or nasal congestion. How to eat during cold or flu: Have two raw cloves of garlic a day or add freshly-crushed garlic to your meal for best treatment. Opt for orange when you want to boost the defensive power of your immune system against viruses and bacteria. Carrots are a good source of beta-carotene, a phytonutrient that contributes to the production of immune system cells that fight with the diseases by destroying microbes. Also beta carotene in carrots turns into vitamin A, which is important for skin health. And skin plays a crucial role in protecting your body from viruses and bacteria. How to eat during cold or flu:Eat half a cup of fresh baby carrots a day or eat other foods, rich in beta-carotene such as sweet potato, pumpkin, squash and cantaloupe. Eating yogurt with live bacteria when you have cold or flu is a good way to improve your health. Friendly bacteria stimulate the production of white blood cells, which fight off the diseases. People, who ate yogurt with live bacteria on a regular basis, had higher levels of immune system T cells, which keep our body from disease-causing germs. Bacteria in yogurt also help to absorb many nutrients, which are important for our immune system. How to eat during cold or flu:The best way to reap all the benefits from yogurt is to have one or two 6-ounce servings of yogurt a day. Choose low-fat, sugar-free yogurt with “live active cultures” seal. Morning cereals are not only a good start of your day, but also great food to eat when you have common cold or flu. Whole grains such as oats and barley are rich in beta-glucan, a soluble fiber with powerful immune boosting properties. Beta-glucan in oats and barley boosts immunity acting like a well-known Echinacea. Eating whole grain cereals will help you prevent flu, herpes and other viral infections. Also compounds in whole grains contribute to faster wound healing and increases the effectiveness of antibiotics. How to eat during cold or flu:Have at least one serving of whole grains a day for the best results. Do not forget about eating seafood when you have cold or flu as it contains a lot of beneficial nutrients. Shellfish such as crabs, lobsters and oysters is a good source of selenium, which contribute to the production of white blood cells that fight off flu viruses. Oysters are also rich in zinc, an important element for cell functions and your immune system. Zinc prevents infections, acting against viruses and bacteria and stimulating immune system response. Shrimps are also a good source of zinc, iron, protein and vitamin B, which are all vital for immune system. Fish such as salmon, herring and mackerel contain essential omega-3 fatty acids, which help to protect your respiratory system from common cold and flu. How to eat during cold or flu:Have two servings of seafood per week for optimal health. Berries not only taste good, but also are rich in vitamins and nutrients that help to protect your body from a great number of diseases, including common cold and flu. Brightly colored berries like cranberries, blueberries, cherries and others are all a great source of antioxidants, which prevent cells damage and boost immune system. Raspberries are a well-known natural remedy to relieve fever and treatment of sinus infections. Blueberries and wild cherries can be used to treat cough. Warm black current juice is known to relieve sore throat. How to eat during cold or flu:Have at least 1 ½ �to 2 cups of fruit or berries a day during cold. Warm liquids like soups, tea, water and juices are especially important when you have common cold and flu. Scientists proved that traditional chicken soup is a good home remedy during cold or flu. Chicken soup contains cysteine, an amino acid that acts like common bronchitis drug acetylcysteine, which protects the bronchial tubes from the accumulation of inflammatory cells. Warm salty chicken broth also prevents thickening of the mucus, keeping the temperature in the throat high and relieving cough symptoms. Garlic and onion, which are often added to the chicken soup have immune-boosting effect. How to eat during cold or flu:Have a bowl of chicken soup when you feel sick. Mushrooms are popular home remedy for cold and flu in China and Japan. Mushrooms are known to boost immune system, by helping your body produce white blood cells, which fight off the infection. Shiitake mushrooms are especially rich in beta-glucan that activates your immune system and guard your body against infections. How to eat during cold or flu:Have an ounce of mushrooms several times a day for the maximum protection against common cold and flu. Honey is a common natural remedy used for centuries for cold and flu. A study conducted at Penn State Colledge of Medicine showed that honey is very effective home remedy for coughs for children. Honey relieves sore throat, reduces cough and help you sleep more soundly. Children, who were given 1 to 2 teaspoons of buckwheat honey before bed, coughed less. It also contains a lot of antioxidants and has antibacterial effect. Warm water with honey and lemon is a good remedy for relieving congestion and staying hydrated during cold and flu. How to eat during cold or flu:For adults, have 2-3 teaspoons of honey every two hours, and for children over 1 year try a teaspoon of honey before bed. Lemons are among most popular remedies during common cold and flu due to its great properties. Lemons, like other citrus fruits including oranges, contain the highest amounts of vitamin C, which protects your body from cell damage and boosts immune system. The rind of the lemon is rich in liminene and liminoids substances that improve immune system functioning. Lemon juice helps to relive congestion, keeping the mucus thin. How to eat during cold or flu:Drink warm water with the juice of one lemon and one tablespoon of honey to relive common cold and flu symptoms. 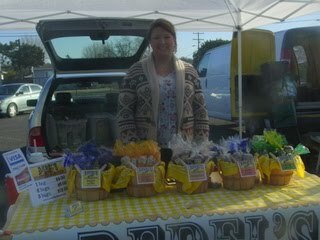 The Santa Rosa Farmers Market is now on Facebook. Farmers and artisans will be posting their schedules and what’s new so follow us to keep up with the latest happenings at the market. You do want to know when the first crab are in or when Ma and Pa Silva show up with their tomato plants?